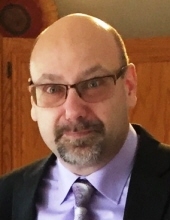 Adam Bobek, age 50, passed away suddenly on Saturday, September 22, 2018. Adam is survived by his beloved wife and best friend, Theresa (nee Baker), his proud mother Sophie (nee Tylka), his dear father-in-law, David Baker, and his loving brothers Chris (Ursula) Bobek and John (Jo Anne) Bobek. He was a cherished uncle to Lily, Jacob, Christian, and Julia. Adam is preceded in death by his father, Jan Bobek. Adam enjoyed spending time with his pets and family, nature, and watching the Chicago Blackhawks. Adam will be remembered for being a spiritual man, his big heartedness, and his devotion to his family. He will be deeply missed by all that knew him. Visitation will be held on Wednesday, September 26th, from 3-9 p.m., at Petkus-Lemont Funeral Home (12401 Archer Ave, Lemont, IL). Interment will be private. In lieu of flowers, the family is asking that donations be made to St. Jude or Lurie Childrens Hospitals in Adam’s honor. To send flowers or a remembrance gift to the family of Adam J. Bobek, please visit our Tribute Store. "Email Address" would like to share the life celebration of Adam J. Bobek. Click on the "link" to go to share a favorite memory or leave a condolence message for the family.